Do you know someone having a 60th birthday or special birthday? If so, then these Birthday Personalized T-shirts are a perfect personalized gift to celebrate this fun event. Our Birthday Personalized Shirt is available on our premium white 100% cotton Personalized T-Shirt, machine washable in adult sizes S-3XL. Also available in Ash Gray or Pink. 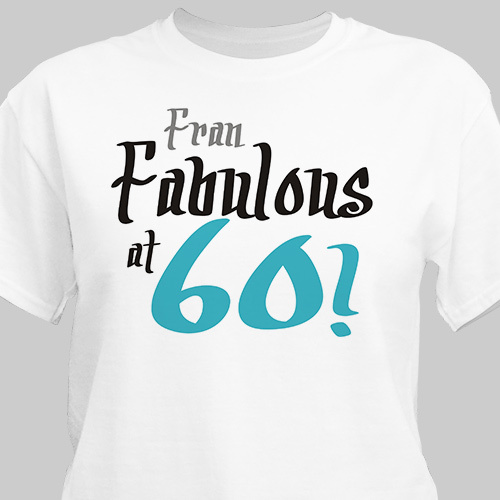 Personalize your Fabulous 60th Birthday T-Shirt with any name and age. Choose color for age. Came just as expected. Good product. The product was reasonably priced,easy to order and was delivered very quickly. Your website offers a great variety. GiftsForYouNow.com offers a large assortment of Personalized 60th Birthday Gifts. We have Personalized 60th Birthday Frames, Personalized 60th Birthday Shirts & 60th Birthday Keepsakes. Our Personalized Birthday Frames are great to give to close friends & family.